I've subscribed to The Sun Magazine off and on for years now. It's this quirky little ad-free monthly wonder, focused on personal writing. They also publish the occasional short story or poem, and they accompany their selections with fabulous black-and-white photography, but the reason I keep coming back is the personal narratives in which contributors bare their souls and offer them up as artwork made public. It's candid, sometimes uncomfortable, and always utterly compelling. Krista Bremer is the associate publisher of The Sun, and it was this connection that made me eager to read her recently-published memoir. 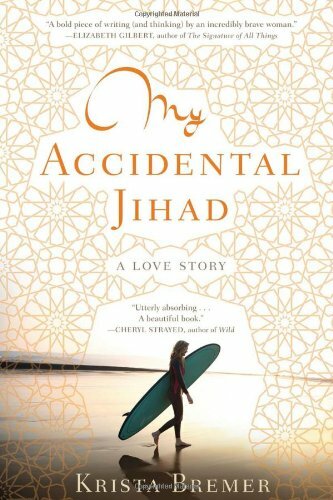 In the shamelessly honest way typical of the magazine, Bremer tells her life's love story: how she, as a tall blonde twentysomething, met Ismail, the middle-aged Libyan immigrant who would become her loving, imperfect husband. Bremer and her mate come together across a wide gulf of differences. He is a practicing Muslim; she was raised a secular Christian. He lives in a small, sparsely furnished apartment, his possessions limited to the bare essentials; she is a typical American consumer who hasn't put much thought into her spending habits. He is vivacious, with a loud booming voice and a penchant for haggling when making purchases, which makes her feel conspicuous and embarrassed. Bremer readily admits that their relationship has not been an easy one, that many times she has wished for a husband whose culture matches hers. However, Bremer has also found great joy and fulfillment in her marriage to Ismail. She portrays him as patient, loyal, and practical—traits she knows she needs to cultivate in herself. Their unique union creates some genuinely funny moments as well, including Bremer's consistent failure to explain “the Christmas spirit” in a way Ismail understands. She playfully describes Ismail's heedless devotion to his ancient Toyota, replete with duct-taped seats and broken air conditioner. I love getting inside other people's heads, and reading memoirs is a great way to do that. I love the honesty that Bremer brings to her writing and to The Sun as a whole. Most of all, I love reading books that help me understand other people's lives. Bremer and her husband may be flawed, their backgrounds antithetical, but their love is strong and hard-earned. If you enjoy this book, you may also like Ann Patchett's essay collection This is the Story of a Happy Marriage, which I recommended here. With regards to NetGalley and the publisher for the advance copy.